Wat Phra That Phanom in north-eastern Thailand is officially classed as one of the 6 most important Buddhist temples in Thailand and arguably one of the most sacred locations for Buddhists outside of India. 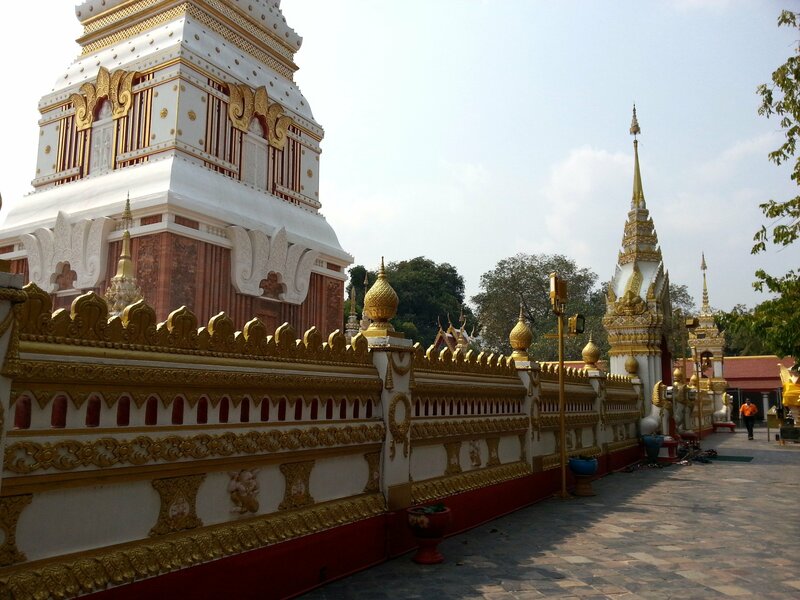 Wat Phra That Phanom is free to enter and open every day of the year from around 06:30 to 18:30 (daylight hours). Bear in mind that an important festival happens at this temple every year from the 10th day of the third lunar month (sometime in February or March) and at this time Wat Phra That Phanom becomes very busy and you will have difficulties seeing much of the temple, although you will see a very vibrant festival. Wat Phra That Phanom is very well known to Thai people and Buddhists from other Asian countries, but seldom visited by non-Asian tourists. 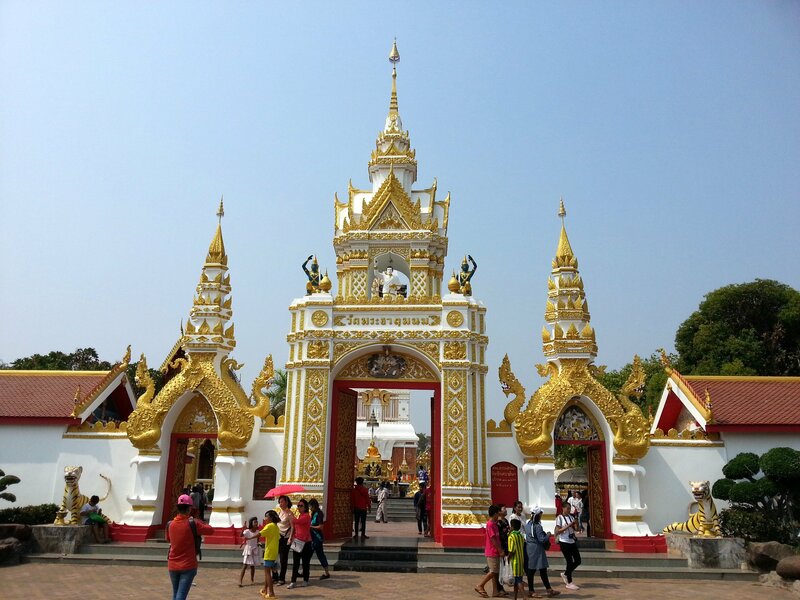 The reason for this is partlyy that the temple is situated in the far north-east of Thailand near the Laos border and not close to the better known tourist destinations such as Ayutthaya and Chiang Mai. The easiest ways to get to That Phanom are either to take a direct bus from Bangkok to That Phanom town, or if you are coming from, going to, Laos over the Thai-Lao Friendship Bridge 3, by taking a 40 THB ride in a beige shared songthaew taxi from the Aphiban Bancha Road in Nakhon Phanom Town to That Phanom town where the temple is located. 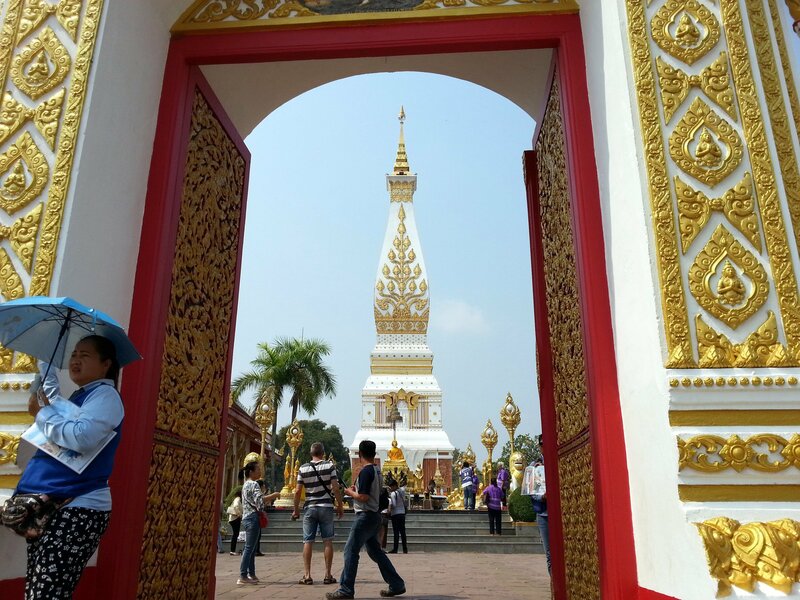 There are lots of interesting things to see at Wat Phra That Phanom, but the overwhelmingly most important part of the temple is its 57 metres tall white and gold chedi known locally as That Phanom. The chedi dominates the local skyline and you see the chedi from some distance away as you drive there. The chedi at Wat Phra That Phanom has been rebuilt lots of times. The earliest incarnation of the chedi is believed to have been constructed at some point from the 8th to 10th Century and to have been just a few meters high, but still probably the first chedi to be constructed in the north-east of Thailand. The temple got rebuilt again sometime around the 16th or 17th Century to larger size. This grander Laotian style second version of the chedi became neglected in the 18th and 19th Centuries as regional politics and power structures changed, and the area around the Mekong River became less important as a religious and governmental centre. A third incarnation of Wat Phra That Phanom is attributed to the efforts of the famous monks of Thailand’s Forest Tradition, an austere branch of Thailand’s Buddhist clergy, who convinced local people in That Phanom of the chedi’s great religious important. 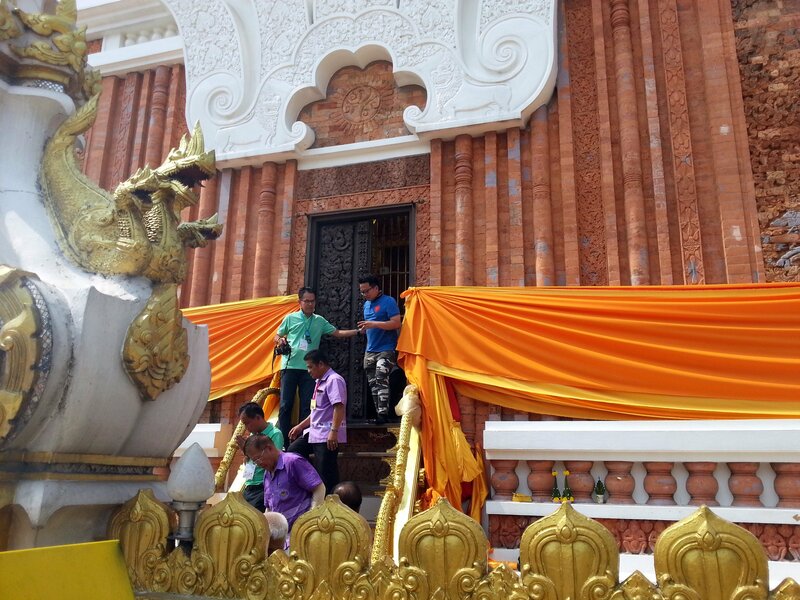 Local people lobbied the Buddhist Community and the Government and a new chedi was built, this time to a height of 43 metres. The fourth and final incarnation of the chedi (57 metres high) was constructed after the third one fell down following a storm in 1975. The reason why the chedi at Wat Phra That Phanom was built in the first place, and continually rebuilt each time taller and more ornate than the time before, is because the chedi is believed to house an important religious relic: the breast bone of the Lord Buddha. 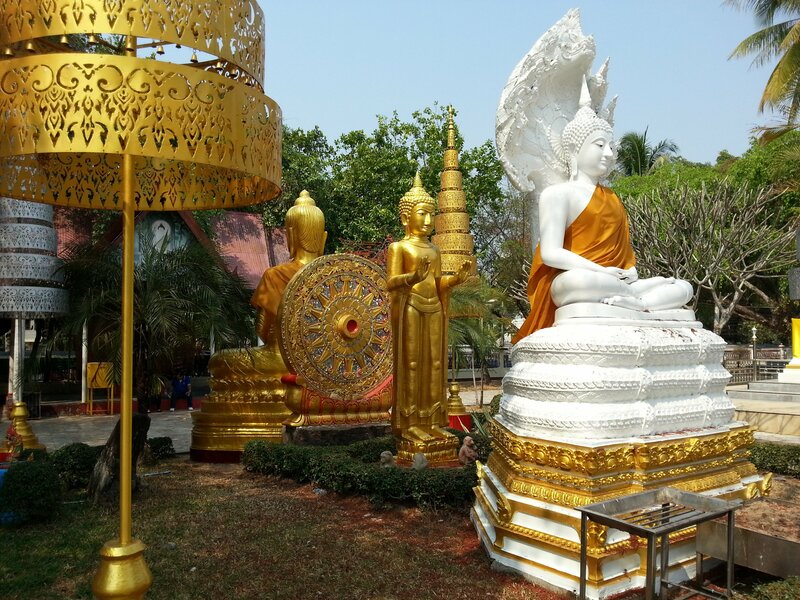 The local legend is that the bone was brought to the site just a few years after the Lord Buddha died by one of his most senior disciples who was endowed with supernatural powers, such as being able to fly, which explains how he transported it all the way from India to the north-east of Thailand, although an explanation of why it was taken to this location is more difficult to find. 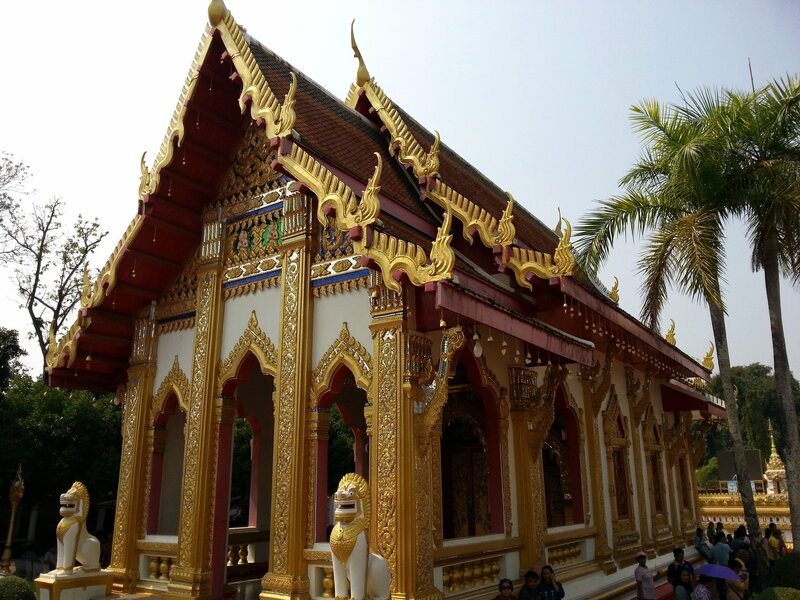 The relic at Wat Phra That Phanom is thought by some Buddhists, and indeed non-Buddhists, to make the site sacred and a place which has mystical powers which can be translated into benefits to people who worship there. 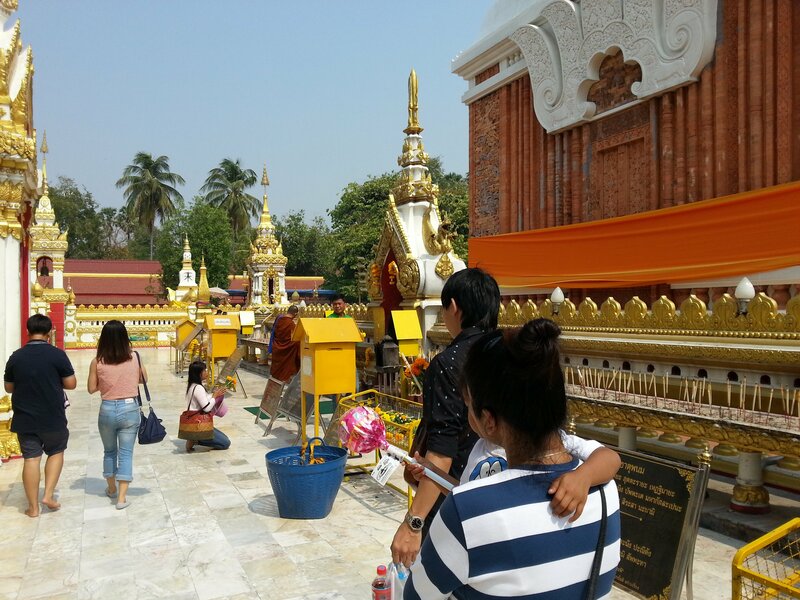 Some Thai Buddhist believe that by visiting the temple on 7 different occasions, and on each occasion walking around the temple 3 times and offering candles and flower, that they can be blessed with a happy and prosperous life as a result. Whatever you do or don’t believe in, Wat Phra That Phanom has an architectural and artistic beauty that creates its own kind of magic. This place is special and everyone who visits will be, to a greater or lesser degree, will be struck by a sense of awe. The temple has a permanent carnival atmosphere about it as a constant stream of (mostly Thai) people come here from early morning to early evening to see the chedi, worship, and get their photograph taken by one of the main professional photographers who hang around the temple offering a large printed picture of you and your fellow visitors taken in front of the chedi for only 100 THB a piece, or 200 THB framed. If you go, get the photo done as they are great value and very good quality. As well as marvelling at the 57 metre chedi at Wat Phra That Phanom take some time to wander around the grounds of the temple. The other buildings, and particularly the statues in the grounds, are really good. There are no signs explaining what each of statues are or, or indeed the age and origin of the mysterious giant stone lingam between the ordination hall and the chedi, but each is a work of art in its own right to be viewed and admired. 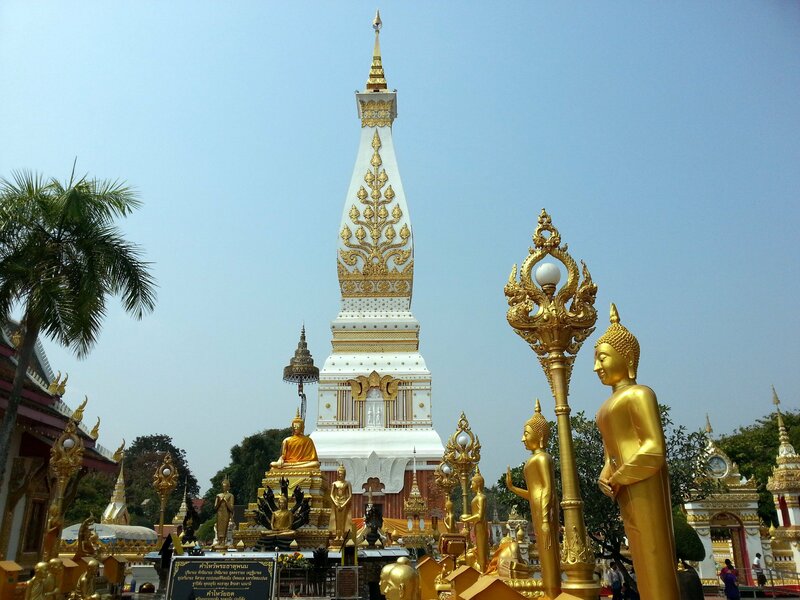 Wat Phra That Phanom is located 58.3 km by road from Nakhon Phanom Bus Station.